Long before Fu Ping published Bend, Not Break, before she told Inc. the current version of her life story in 2005, she published a much simpler version in a book named Drifting Bottle (漂流瓶) in Chinese. 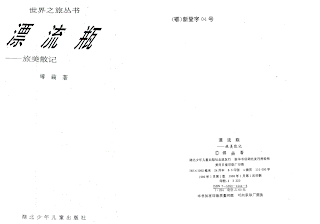 The book, published in China by the Hubei Youth Press (湖北少年儿童出版社) in 1996. 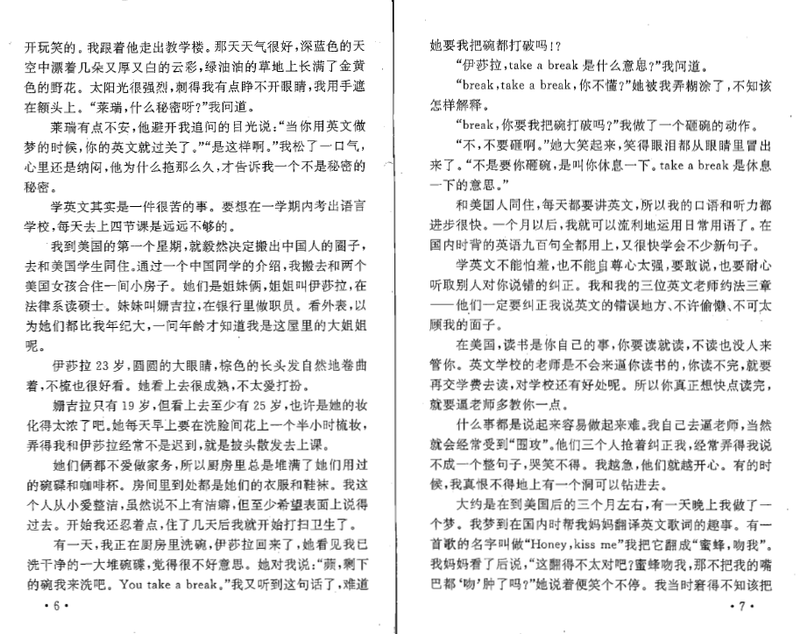 In the "Author's Foreword" section, Fu Ping stated that she spent two years, finishing in October, 1994, at Hong Kong, writing it. Her parents had helped her in proof-reading and copying. 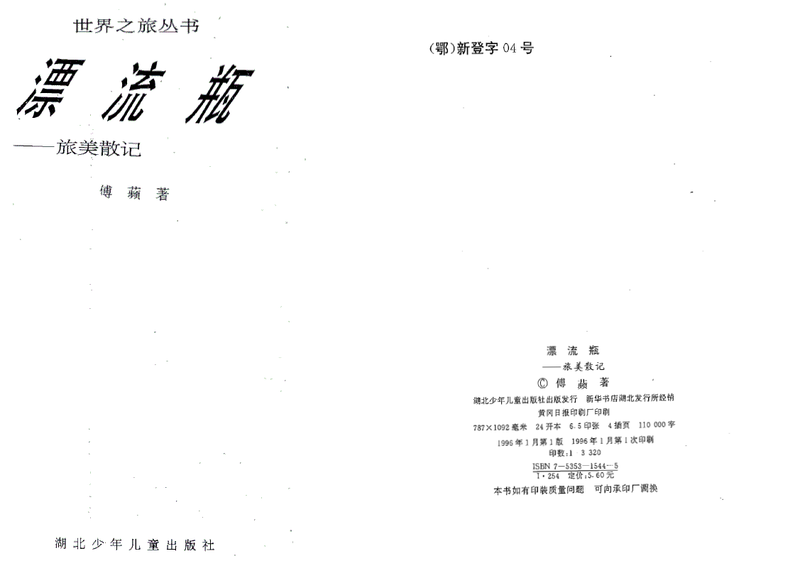 According to Fang Zhouzi, who has obtained a copy of this book, the book is not a fictional novel but a true memoir. It includes many pictures of the author and her family members as well as friends. Fu Ping herself has also stated that she wrote this book to tell Chinese readers her life in America. Fu Ping spent her entire childhood in Nanjing, not Shanghai. Her aunt and uncle were not mentioned at all. 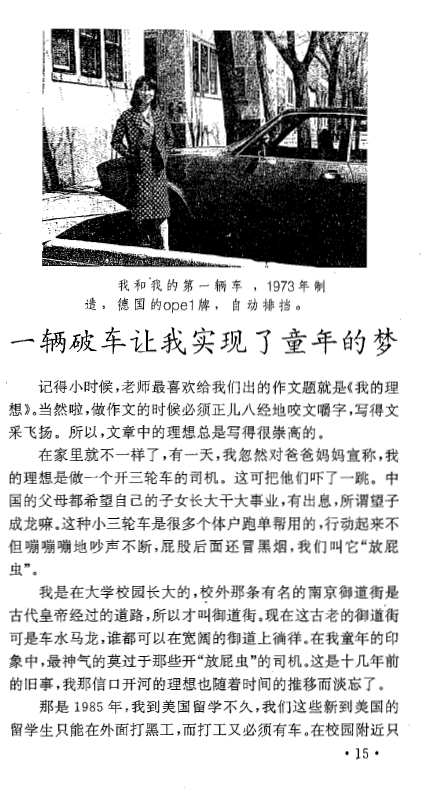 On Page 15 (below), she wrote, "I grew up on a university campus, right outside is a famous street of Nanjing..." And on Page 88: "This is WuChao Gate (午朝门). It's very close to my home. I played here a lot when I was little." Fu Ping spent her childhood with her (biological) parents and attended school normally. On Page 15 (below), she wrote, "I remember when I was little, our teacher likes to make us write essays on "My Dream". Of course, writing an essay must be real serious and with great style. So, the dreams in these essays are always very noble. But it's different at home. One day, I suddenly announced to my parents that my dream is to become a truck driver. This shocked them..."
Fu Ping did not suffer hardship during her childhood. In this book, when describing that she had to work as a maid in an American family and was treated unfairly by her employer, she wrote on Page 11, "In my own country I was a professor's daughter and spoiled by my parents. I had never had to do such work." There was no mention of being kidnapped by a Vietnamese-American upon arrival of US. In fact, she described that, on the third day of arriving at Albuquerque, she already met an acquaintance from her Nanjing neighborhood. She would still be locked up by her kidnapper at that time in Bend, not Break. In this book, Fu Ping mentioned that she memorized English 900, a popular language book in China at the time. She was able to immediately strike nice conversations with teachers she met at University of New Mexico and was able to be placed into a mid-level language class. It's a far-cry from knowing only three English words. 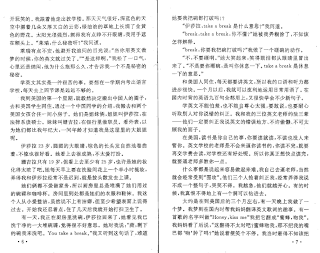 Why no further details from this book 漂流瓶? Would love to read it. 1. All "results of my personal study and research" of this Chinese memoir has been arranged in the top post in this thread, for reading convenience. 2. Add some details in P37~59, P49, P63. I notice discussion about Ping Fu's love experience. From her book, there was a period that she was in relationship with two men, but my view on this fact is that this is very personal and doesn't support our challenges against BNB or her character. 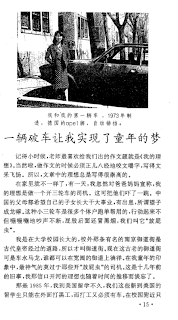 About "flirting in interview", I did not find strong fact in her Chinese memoir. - Ping Fu grew up in Nanjing. No mentioning of her living in Shanghai for long periods. - Ping Fu was loved and well took care of by her parents. She enjoyed good relationship with her parents. - No mentioning of her "Shanghai papa mama". - She possibly had relatives in Shanghai. She mentioned when she was in Shanghai she used to go to Red House restaurant to enjoy western food. - Her family was not a poor one. She was quite used to life enjoyment and spending money in the U.S.
- She was not alone in the U.S. at the very beginning. She lived with Americans in the first week and contacted Kelly after3 days and started a relationship with Kelly within weeks after her arrival. - She had no fear towards men at all. She got involved with Kelly soon after her arrival. In her description more than once she mentioned how much she longed for love and care from others. - No mentioning in the book of her first marriage. In this book H was her first married man. - No mentioning of how she obtained green card. More pages, more pages, please! Regarding Ping's efforts in Hongkong, she "She helped set up NCSA Mosaic and its Web servers". Recall that hundreds or thousands of copies of Mosaic had been downloaded and installed around the world by computer students, her installation of several copies is good, but not significant at all. All network connection was already established. At that time she was staying with her husband who was hired for a one-year job. Above installation was just a small task, of assisting nature. Installation of Mosaic on available network (in 1995) is like replacing a light bulb for a car. For comparison, building Hongkong's internet is like building a car. She did a good job to replace the light bulb, and she was proud and brave enough to claim that she had built the car!! "In early 1995 Ping Fu took her visualization expertise -- as well as Edelsbrunner and their then-8-month-old daughter, Xixi, overseas. She went to Hong Kong's University of Science and Technology to help establish a "mini-NCSA," as she says." The word "SHAME" must have been deleted from her dictionary.